It's not very often that I find myself in this neck of the woods at lunchtime, and frankly there's not much excitement except for our unexplored territory of midtown foodcarts, a few noteworthy Chinese restaurants and some Japanese food I can't get downtown. David happily obliged to lunch with me at Katsuhama especially when I told him it would involve cabbage. Cabbage is one of the most underrated vegetables in the west, but mostly because I don't think people know how to prepare it (maybe with the exception of cole slaw). And especially ever since our trip to Japan last year, D has been crazy about cabbage. 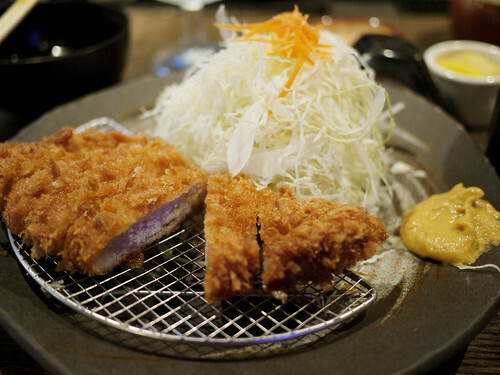 And how was the katsu (which is a Japanese word that is derived from the word "cutlet")? Nothing transcending but well prepared. Just greasy enough but not too greasy. For out of the world katsu, I'll wait until my next trip to Tokyo, but in the meantime, this will do just fine. If you get katsu at one of those "Japanese" (run by non-Japanese) ones, they'll bring out mustard like one you'd find at a Chinese take-out. Do you know which this one was? Also, did they serve the cabbage with sesame or yuzu dressing? Your meal looks ok, and it's not supposed to be greasy anyway. That's not how the folk in Japan usually roll. Last note, if you find a place selling eggplant stuffed with pork, with a katsu husk, let me know; I tried it somewhere in Koto-ku (Tokyo), and haven't found it since. Katsuhama is still Japanese owned, to my knowledge though definitely less so staff wise than it used to be. They still use Japanese ingredients. I seem to remember them having sesame dressing, but I tend to go old-school and just eat it with the tonkatsu sauce.